1812 Brewery is way out there. And way worth a visit. 1812 Brewery, in the mountainous wilds of Allegany County, is named for the year the barn that houses it was built. 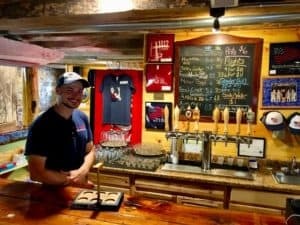 To reach the 1812 Brewery in the mountainous wilds of Allegany County, slip off I-68 just outside Cumberland and follow serpentine blacktop across a one-lane bridge and past signs warning of falling rocks. When you see a momma black bear with two cubs you’re almost there. Ok, I made that last bit up, but this place really is in the back of beyond. 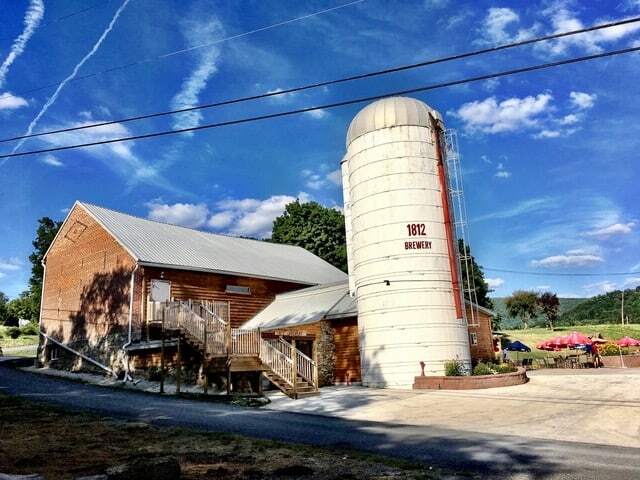 It’s the state’s most far-flung brewery–the only Maryland beermaker west of Hagerstown (which itself is more than 60 miles from Baltimore). As the crow flies, its taps are much closer to Pittsburgh than Charm City. I didn’t know what to expect from such a boondocks brewery, but I have to say my jaw dropped once I rounded the final bend and 1812 hove into view. It’s an absolutely beautiful setup: an ancient brick-and-stone barn overlooking an umbrella-dotted patio with hop vines undulating across a verdant hillside in the near distance. A pair of white-washed, old-school grain silos completes the bucolic vista. The barn houses both the brewing equipment and the taproom and the name is not a nod to the war, but the year the barn was built. 25-year-old Cory McCagh was inspired to make beer after seeing hops growing locally. The ‘here’ is this erstwhile dairy farm his folks had bought 10 years earlier. As he hopped along the hop research trail, he heard about the state’s special farm brewery license. It soon clicked that the hobby could be something more. And just in time. “The barn was getting in really bad shape, to the point where we either had to tear it down or find some purpose for it and restore it,” McCagh says. A farm brewery became the savior. The ground floor taproom features exposed stone walls and stout wooden beams hewn when James Madison was president. The high-ceilinged upper floor house a handsome special events space. (Note to all recently engaged folks in Western Maryland.) The used, 4-barrel brewing system came to this Maryland mountain hollow after seeing use in Canada, California and as far away as Australia. The taps started flowing in April of 2017. And what’s the beer like? After McCagh showed me the acres he has planted in Nugget hops (the vines getting a slow start after a cold, wet spring), it was time to grab a glass. “We always try to have at least six beers on our tap list, and not just stacked with IPAs,” McCagh says. He met head brewer Jason Thomas through the Cumberland Homebrew Club, and assistant brewer Aaron Murphy is an old school chum. Though this is their first professional gig, they seem to know the ropes. The malty Monroe Ale got things started on a tasty, Anglo note. The Beach Creek Session IPA brought plenty of citrusy hops to the mouth party despite the 5.6 ABV. Another crushable quencher was the Fence Mender Pale Wheat, checking in at only 4.5 ABV. Perhaps the star of the show was as an early, off-the-tank sample of a coffee stout made with beans from Cumberland’s Basecamp Coffee Company. Destined for a nitro tap, it’s rich, coffee taste should get a real boost from the creamy mouthfeel. (I had to drive back out that winding road, so my elbow-bending was limited.) Growlers are available and they will soon self-distribute kegs to local bars and restaurants. The 4-barrel brewing system, which started operating at 1812 in April of 2017, was previously used in Canada, California and Australia. It was rather quiet during this Thursday evening visit. On Fridays and Saturdays, McCagh says, they add live music and food trucks to the mix and the barn jumps. Tucked away though it might be, it does serve as a handy pitstop for folks heading to or from Deep Creek Lake and Wisp ski resort. The swanky Rocky Gap Casino, meanwhile, is just five miles away. 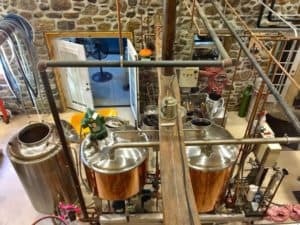 They have also signed on with a program called Harvest Hosts where folks with self-contained RVs can park overnight at breweries, wineries, and farms. “I am surprised by the number of people who travel for beer and plan trips just for hitting breweries,” McCagh says. Brew it and they will come.